Learn how to fix the error 0xC18A HP printers, follow the steps below and if you have any questions, please feel free to comment, it will be answered. This type of error usually occur in HP Photosmart printers can appear in another printer but either means you have any problem with the ink system. 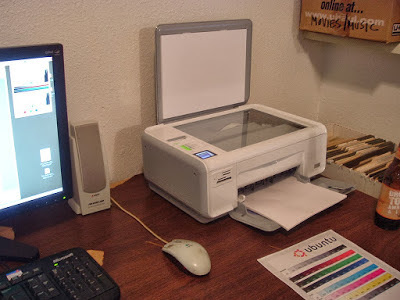 Since these continuous ink printers have much less is recommended that you install, the truth is that the problem is because the ink cartridges can not print correctly, either because they are too hot or otherwise. The solution to this problem we will try to explain below, always remember if you have any questions just post a comment, will be responded in record time, with the most effective solution possible. The following steps should be followed as it is to get the reset work, it must be clear that this process will not work on all errors, only beginning with the error described above. The first thing to do is (with the printer turned on) press and hold the left arrow on the printer. Now press the arrow setup and release both simultaneously. The printer screen asked to enter the special key combo "Enter Special Key Combo"
Press and release the OK button. You could say that we are in the service mode of the HP Photosmart printer, then another procedure shall terminate error with start 0xC18A. Navigate the menu to the left, until you see on the screen "System Configuration Menu"
"The status of the failed hardware" appears on the screen, if this option is not displayed, press the OK button. The screen will say "hardware error status, press OK to delete". We press OK and display appears the new message that "the mistake is being removed press cancel to continue". Press Cancel all the times it takes to follow, until a message that says Welcome to Photosmart Express. Turn off the printer and disconnect the power cord electricity. Wait about 2 minutes to connect the printer again. When the printer is turned on again, at first be submitted messages initializing ink cartridges should not interrupt this process, when finished will print a test page. To check the operation yourself, you should print another test page, this way you will see when it is available to begin the installation of the software. Remember, if you have questions or other shorter solution of this procedure just write a comment, gladly be answered.